Th-INK-ing of You: Have a Sunny Happy Day! Hello friends! I hope you are having a sunny happy day! Today's Way to Use it challenge on SCS was to make a Sunny Card... and this is what I came up with. I used a Tim Holtz stencil and SU! Daffodil Delight ink and sponged my sun rays on a white embossed layer from a box of Martha Stewart card bases. I adhered that to a yellow base. 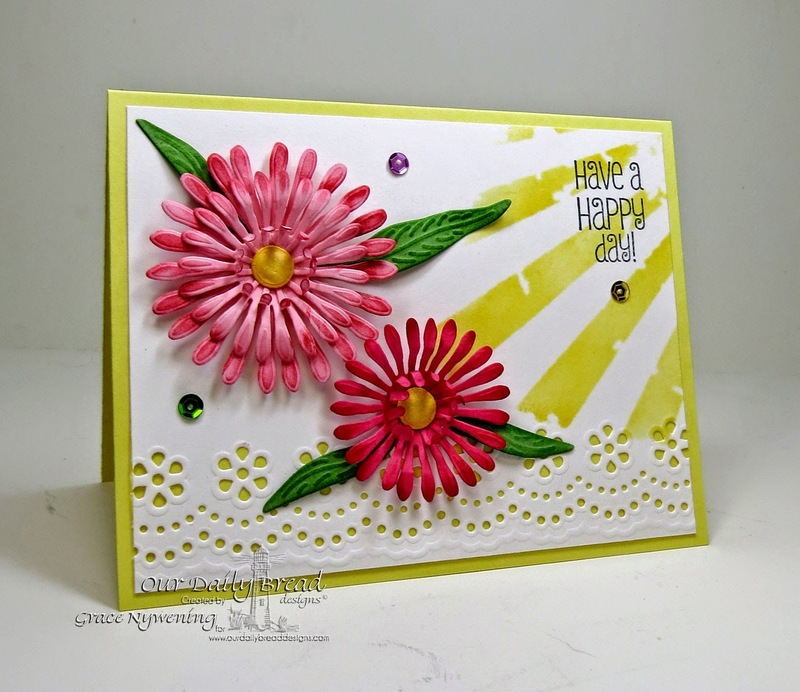 I stamped the fun sentiment from an ODBD set called Be Joyful over the sun rays, then I die cut some Asters from scraps of pink card stock, using this month's release, ODBD Custom Aster and Leaves dies. I just love these dies... I did a little curling of petals on my piercing tool, and sponged the edges a little bit, but basically just let the dies to the work. I added a sprinkling of sequins just for fun. I think all of us would agree that we just feel better when the sun is out! People who live in very rainy dark parts of the world often suffer mood disorders and depression. The sun seems to lift our spirits and give us a brighter outlook, even amidst trials and struggles. As I was thinking about this today, I thought about what heaven will be like... where there will be no need of the sun... because the glory of God will lighten it! He IS Light! If we know the Lord as our Savoir, we have so much to look forward to! We can't even imagine what it will be like to live in the very presence of The Light.... but I do know it will be wonderful.. even better than the sunniest happiest day we can imagine here on this earth!!! Thank you for stopping by, and I hope YOU have a Sunny and Happy Day!!! Your card is lovely. The stenciled background is such a nice backdrop for the flowers. Thanks for your uplifting cards! Grace this is gorgeous - I know what you mean about the sun making us feel better :-). I too look forward to eternity with Jesus. Gorgeous card Grace. The flowers are very beautiful! bright and cheery. And Yes, how great and joyful it is to know that there is no need of light in heaven as we worship the Lord who is light himself! Oh, Grace, this is bright and sunny, and I LOVE it! You've made such beautiful sunbeams, and your flowers are gorgeous! What a delight! Hugs, sweet friend! This is gorgeous Grace. Love the new dies..
Oh how bright and cheery, Grace!! I just love the rays of sunshine paired with the gorgeous pink aster!! Stunning design! !